Marine mammals are an important part of the Russian River estuary ecosystem. Gray whales can be seen feeding near the Russian River outlet as they migrate between their northern feeding grounds and their southern breading lagoons along the coast of Baja and southern California. 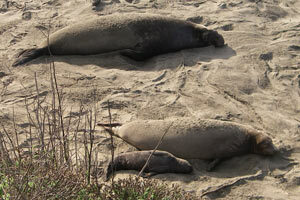 Other migratory species, including California sea lions, northern elephant seals and northern fur seals, use the protected area of the Russian River outlet and sandy barrier beach at Goat Rock State Beach for resting and refuge. Harbor seals are a resident species of marine mammal that have been observed at the Russian River estuary since 1974 (Mortenson and Twohy 1995). Goat Rock State Beach is home to the largest concentration of harbor seals along the Sonoma County Coast (Codde et al. 2011). Visitors to the Russian River estuary will have a chance to observe these shy mammals while stopping at the Highway 1 overlook in Jenner, walking along the beach, or kayaking in the estuary. Harbor seals use the beach to rest, warm up, molt, give birth and nurse their pups. Females give birth to one pup annually between March and June. Harbor seal pups are very precocial and can swim immediately after birth. Females remain with their pups, feeding them rich milk for approximately 30 days and pups may double in size by the time they are weaned. Following the pupping season, harbor seals molt their worn fur and spend more time ashore aiding the process of growing a new coat. Harbor seals breed in the water and adult males defend underwater territories near the beaches where females are hauled out. Visitors to the Russian River Estuary in June and July may see the territorial displays of the males slapping their flippers on the water’s surface. The productive waters near the Russian River outlet provide foraging grounds for these generalist predators, which are known to feed on a variety of locally abundant fishes and cephalopods (Hanson 1993). Feeding near the top of the local food chain puts harbor seals in the unique position of acting as an indicator of the overall health of our ecosystem. By monitoring the population of seals that call the Russian River their home we are adding to our knowledge of the overall health of this valuable ecosystem. Sea lions are gregarious on land and can often been seen and heard vocalizing (barking) all along the central and northern California coast. Male and juvenile California sea lions can been seen swimming in the waters of the Russian River estuary or occasionally resting on shore at Goat Rock State Beach or nearby rocks. Female sea lions and their young remain near their rookery beaches located on the Channel Islands in southern California year round. Outside of the breeding season, in autumn and winter, adult and sub-adult males can travel as far north as the coast of British Columbia, Canada. Impressive animals both for their size and life history, northern elephant seals may occasionally be observed resting on the sandy beaches of the Russian River estuary. Both male and female elephant seals undergo a long distance semi-annual foraging migration (roughly a distance of 13,000 and 11,000 miles round trip, respectively) returning to shore in the winter for pupping and breeding and in the spring to undergo their annual molt. The nearest rookery beaches are located at Point Reyes headlands to the south with an approximate population size of 1,500 – 2,000 animals, while the overall population size for the species is around 150,000. From 2001 to 2007 a single sub-adult male elephant seal was observed harassing harbor seals at their Goat Rock State Beach haul out, but this individual has not been observed since. 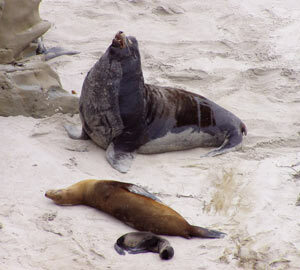 Juvenile elephant seals are occasionally observed on Goat Roack State Beach. 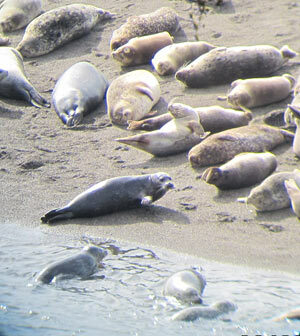 Monitoring of the harbor seals and other pinnipeds located in the Russian River estuary began decades ago in 1982 with the California Department of Fish and Game’s annual statewide census. In 1997 SEALS (Sanctuary Education Awareness and Long-Term Stewardship), a volunteer monitoring and stewardship program developed by the Farallones Marine Sanctuary Association and the Gulf of the Farallones National Marine Sanctuary, began conducting population surveys in Tomales Bay and Bolinas Lagoon, steadily expanding their efforts to the surrounding areas. Beginning in 2000 these surveys included the beaches at GRSB with the help of the local Seal Watch volunteers. Seal Watch of Jenner is coordinated by the Stewards of the Coast and Redwoods (formerly Stewards of Slavianka). As part of the Russian River Estuary Management Project, Sonoma Water in partnership with the Stewards of the Coast and Redwoods (Stewards) developed the Russian River Estuary Management Activities Pinniped Monitoring Plan. This monitoring plan outlines goals for the year-round monitoring of seals located at the Russian River estuary. All management activities and associated biological and physical monitoring in the Estuary are covered by a federal Marine Mammal Protection Act Incidental Harassment Authorization. Annual reports are provided to the National Marine Fisheries Service (NMFS) and the Stewards summarizing the results of population monitoring, biological and physical monitoring of the Estuary, and Russian River Estuary Management Project activities. Hanson, L. C. 1993. The Foraging Ecology of the Harbor Seal, Phoca vitulina, and the California Sea Lion, Zalophus californianus, at the mouth of the Russian River, California. M.A. Thesis, Sonoma State University: 70 pp. Mortenson, J. and Twohy, E. 1995. Harbor Seals at Jenner, CA 1974-1993. Duncans Mills, Ca: Stewards of Slavianka, Sonoma Coast State Beach, California Department of Parks and Recreation, 34 pp. Codde, S., Press, D., Roberts, D., and Allen, S. 2011. Pacific Harbor Seal (Phoca vitulina richardsi) Monitoring at Point Reyes National Seashore and Golden Gate National Recreation Area, 2010 Annual Report. Natural Resource Technical Report NPS/SFAN/NRTR—2011/465. Point Reyes Station, CA: 46pp.